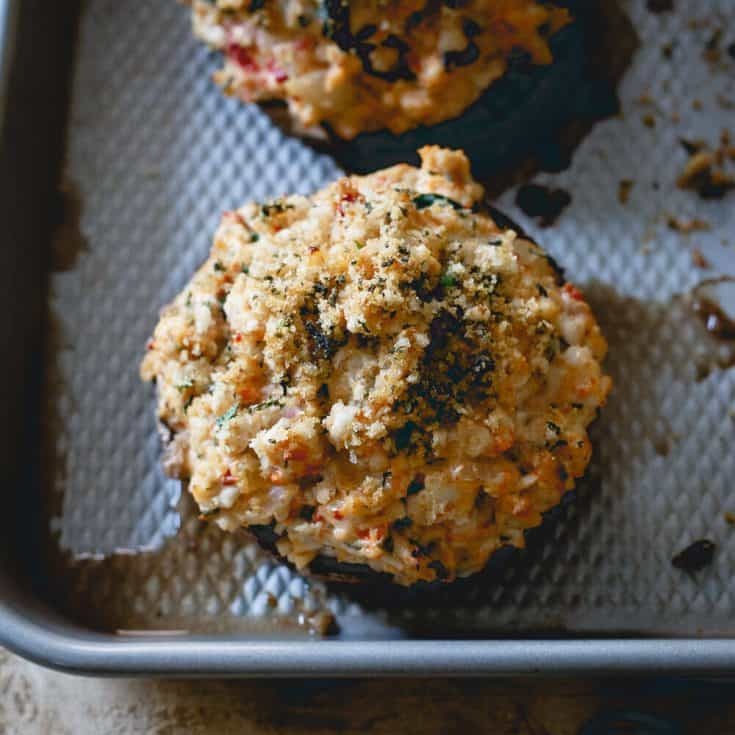 These turkey stuffed portobello mushrooms have creamy black garlic cheese, spinach, onions and roasted red peppers for an easy and unbelievably tasty dinner! Want to laugh? One of the first recipes I posted (about a whole month into blogging) was for spinach and cheese stuffed portobello mushrooms. Go take a look at that post (don’t be thrown off by the first picture of that phallic mushroom from wikipedia) then come back and laugh with me. I still stand by that recipe. 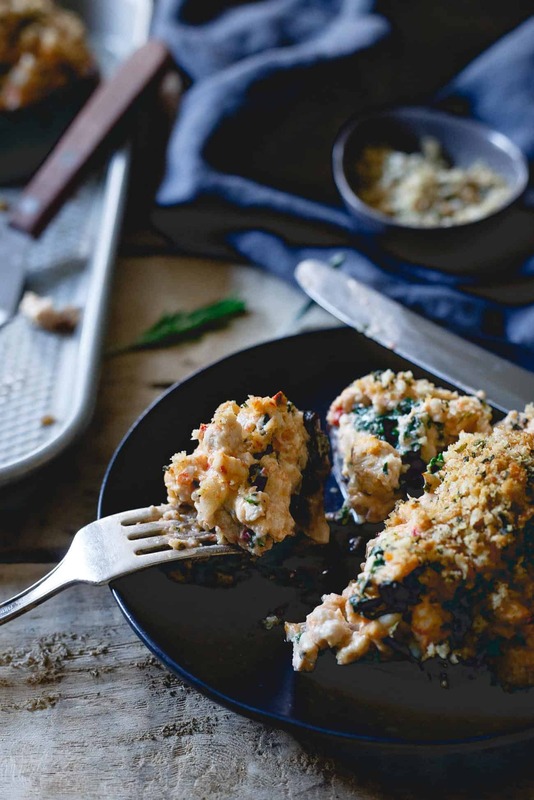 I actually remember how cheesy and delicious it was that day I made it but if given the choice now, pretty sure I’d pick these turkey stuffed portobello mushrooms instead. That whole “we eat with our eyes first” thing might just have some legs. The addition of lean turkey gives them staying power those original stuffed mushrooms didn’t have while the addition of the Finlandia black garlic creamy gourmet cheese (and some extra cheddar for good measure) keeps them creamy and cheesy like any good stuffed vegetable should be. The black garlic gourmet cheese is delicious enough to eat straight out of the container with a simple cracker. In fact, it was hard to save it for the recipe when initially trying it that way. 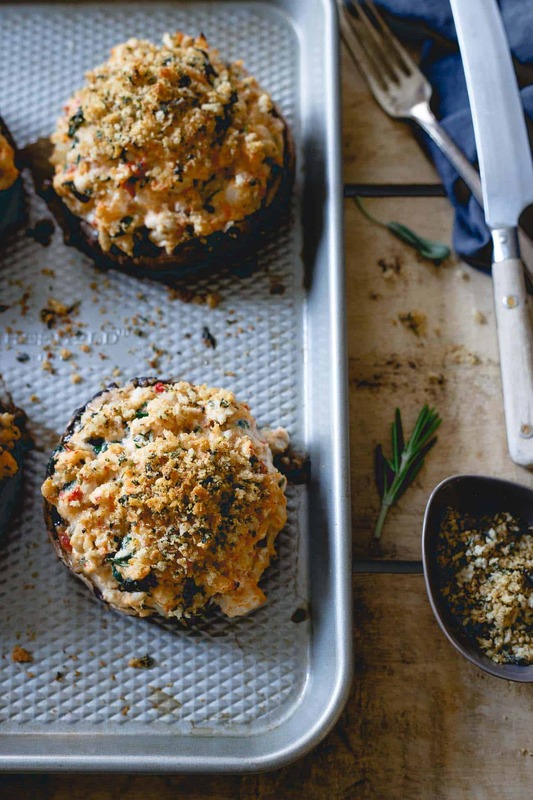 With quality ingredients, nothing artificial and an incredible taste, it’s a spread you could just as easily put out as is for an appetizer tray as you could cooking with it like in these turkey stuffed portobello mushrooms. Considering the timing, feel free to use leftover Thanksgiving turkey (dark meat fans raise your hand!!) in place of the ground turkey, it’ll work just as well. 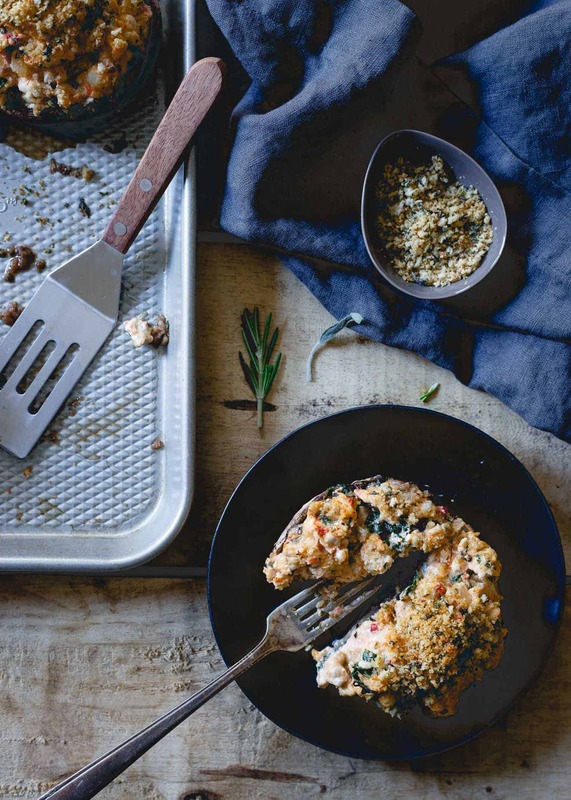 You can also try them with some ground sausage for an even more decadent dinner. Either way, your mouth won’t be disappointed. Want to see more easy recipe videos? Subscribe to RTTK on YouTube! Once hot, add the turkey and onion. Break the turkey into small pieces as it browns with a spatula. Add the spinach and 1 tablespoon of the herbs to the skillet once the turkey is browned. Season with salt and pepper to taste and cook until spinach is wilted. Transfer the turkey mixture to a large bowl. Add the Finlandia cheese, grated cheddar and roasted red peppers. Stir until well combined. Place the portobello mushrooms on a baking sheet gill side up and fill each mushroom with the turkey mixture. Place the butter in a small pan over medium heat. Once melted, add the breadcrumbs and remaining tablespoon of herbs. Stir with a spatula so that the breadcrumbs absorb the butter. Cook over medium heat 2-3 minutes until slightly toasted. Remove from heat and sprinkle the breadcrumb mixture on top of each filled mushroom. Bake the mushrooms for about 20 minutes until mushrooms start to give off liquid. You can find Finlandia Creamy Gourmet Cheeses at Shoprite, Price Chopper and Kings supermarkets. 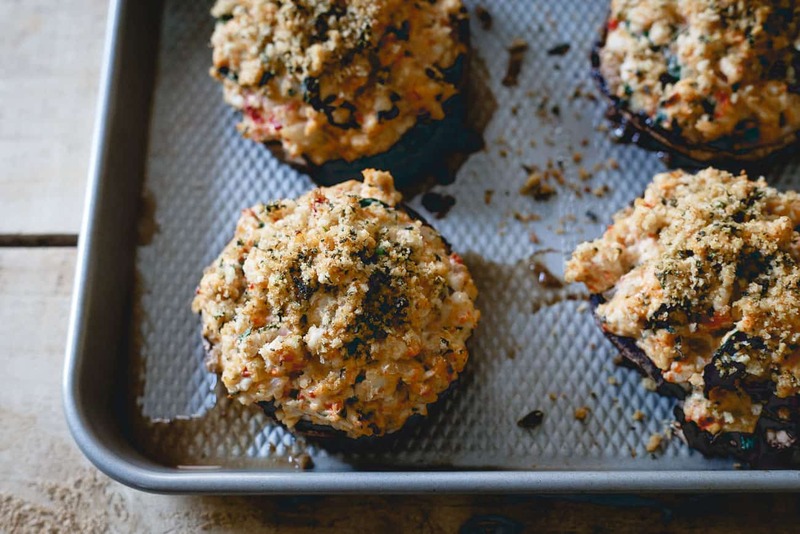 i have not made stuffed mushrooms in a while but this sounds sooo good. i love your videos and easy demo. I love how easy these are Gina! And I haven’t tried that cheese yet by Filandia. Can’t wait to get some and try these. Happy Thanksgiving! What a great idea for turkey leftovers, love these! I want to drop everything I’m doing and make a pan of these right away! I can never resist anything with portobellos and that black garlic cheese sounds to-die-for delicious. These mushrooms may get me to even love mushrooms! I tooootally cook with them, but it would take having one stuffed like this for me to be like OH HECK YEAH! So, for the sake of mushrooms everwhere, feed me? Honestly, I cannot wait to make these! They sound awesome! That black garlic gourmet cheese sounds ahhmazing! 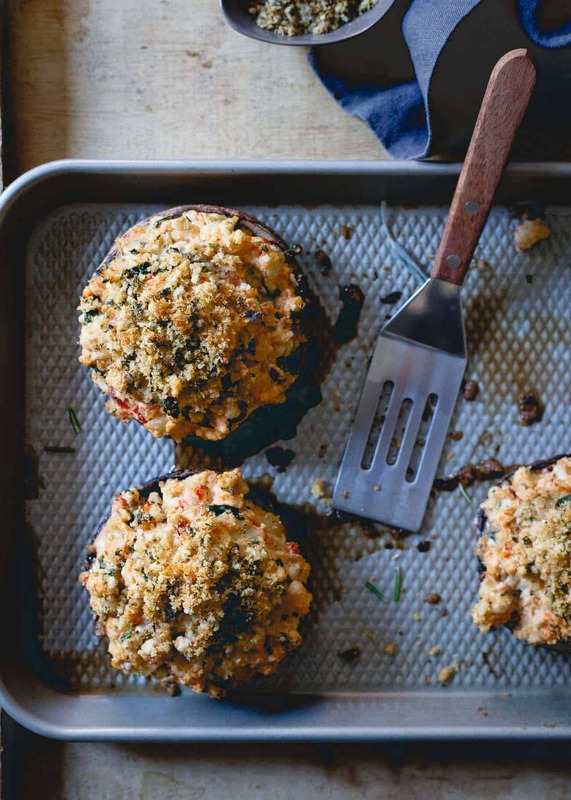 And so do these turkey stuffed portobello mushrooms! These are so going on my need to make list! HEAVEN! Literal heaven! This recipe is absolutely genius! I love mushrooms and drench everything in garlic powder! SO SO SO EXCITED to make these! Cannot wait for dinner tomorrow night! Thanks for posting Gina! Cheers! Oh my YUM. I’m in love with all the flavors going on here, and I NEED to get my hands on some black garlic cheese. The photos are beautiful as well…so elegant!